Conor McPherson, the prolific Irish playwright whose work includes such psychologically chilling plays as “The Weir,” “Dublin Carol,” “Shining City” and “The Seafarer,” is a seductive storyteller clearly possessed by an obsession with ghosts, Faustian bargains and the powerful forces of love and loss. Though he is now 47, McPherson was just 26 when he wrote “St. 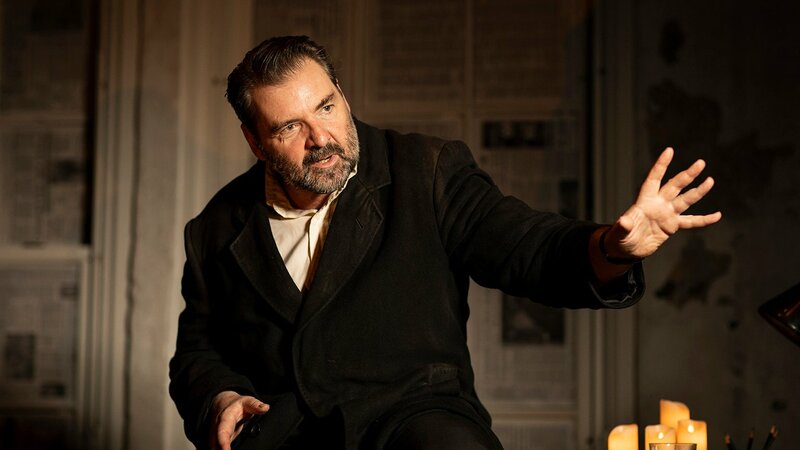 Nicholas,” the one-man show currently being performed at the Goodman Theatre by Brendan Coyle, the Olivier Award-winning actor most widely known for his role as Mr. Bates, the war-disabled valet in “Downton Abbey.” And listening to the play - a remount of director Simon Evans’ 2018 revival of the work for London’s Donmar Warehouse - it is impossible not to marvel at what was his wholly precocious understanding of a male midlife crisis, and its potent (or perhaps impotent) mix of self-loathing, self-destruction, despair and possible enlightenment. The unnamed Irish theater critic who both bares and sells his soul in “St. Nicholas” (a play whose title remains a mystery), is a burnt-out mess. A married father of a son and daughter, he is a well-paid journalist whose opinions have considerable impact and whose approval is widely courted. But that is his public image. When we find him holed up in his barren office, whose five large windows are covered with yellowing newspaper clips (a clever design by Peter McKintosh, with lighting the color of nicotine stains by Matt Daw, and subtly haunting sound by Christopher Shutt that is aided and abetted by the Chicago “L” just outside the theater walls), we learn very quickly that he has come to consider himself a pretentious phony. Though read widely and feared by the actors and directors he writes about, he knows there is something hollow about his life and work. And he makes no secret of the fact that he spends far more of his time drinking than writing. And then there is a moment of crisis. It happens as he watches an otherwise mediocre production of “Salome” at Dublin’s Abbey Theatre and finds himself transfixed by Helen, the graceful young actress playing the title role of the dangerous seductress of Biblical fame. Throwing all caution to the winds, he soon decides to follow the show’s cast to its London engagement where he engages in a creepy, bungled act of stalking. But that is only the beginning of what turns into a living nightmare: An all too real alcohol-fueled hallucination grows particularly weird following his encounter with William, the handsome, mild-mannered vampire he encounters in a park after a feverish night of binge drinking. The vampire, who feeds on the vital force of the living, leads him to a suburban mansion where he makes the critic an offer he eventually cannot refuse. His task? To head into the city each night and entice a group of young, attractive people to come back to the house and engage in decadent pleasures with a colony of vampires. And as it happens, he turns out to be good at the job steadily supplying youthful energy to the undead. But it is not long before he starts to sense the diminishing returns of the whole compulsive enterprise. And it becomes clear to him that clock of life cannot be turned backward. As the critic emerges from what might have been a total mental breakdown, he begins to understand the intensity and value of “now.” And what, in lesser hands, might have been a pop vampire tale about a man who these days easily could have raised the ire of the #MeToo movement, turns into an existential journey in which love, work, aging, death - and hope - find their rightful place. Plus, a writer finds his story. It takes an actor of formidable technique to bring this two-act, two-hour monologue to vivid, active, almost cinematic life. And from the moment the lights allow Coyle, dressed in a black overcoat, to emerge from the shadows and stand in an extended silence that solidifies the audience’s attention, the spell is cast. Without any histrionics, and with meticulously calculated pacing, Coyle proves he is an ideal interpreter of McPherson’s twisted, bitingly observant and ghostly psychological/spiritual road trip. And he expertly sustains the narrative even in those moments when the trip seems a bit too long and repetitive. As McPherson explains, vampires have the power to make you want what they want. So do the most gifted playwrights and actors. “St. Nicholas” runs through Jan. 27 at the Goodman Theatre, 170 N. Dearborn St. For tickets ($31-$85) call (312) 443-3800 or visit www.goodmantheatre.org. Running time is 2 hours with one intermission.